To make the traditional injera sourdough flatbread, teff is fermented and dried prior to milling. 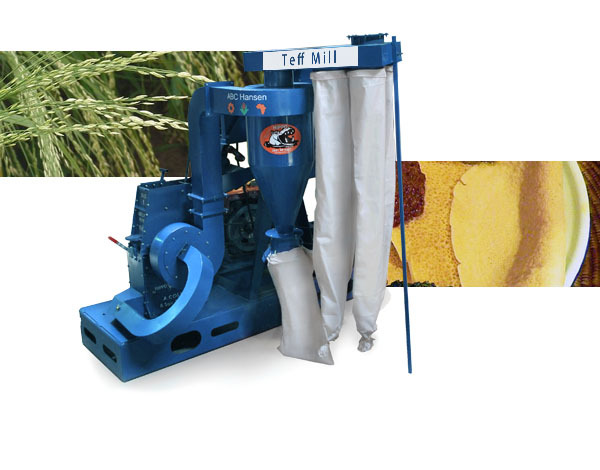 The Universal mill with stone application for low capacity usage, or a 600mm or 950mm horizontal stone mill are good choices to process teff flour which should be very fine. It is recommended to screen out all coarse particles prior to packing when sold commercially as teff flour should be fine and not gritty when rubbed between the fingers. When used as a traditional flour, teff flour need not be screened but requires good stone milling practice. Organic teff flour can be milled with stone mills and gluten free sandwich loaves or free loaves can be baked.